Literary Hoots: I Will Take a Nap! Fantastic book from Mo Willems yet again! What I particularly appreciated about this one is that the story helps empower young kids. It helps them recognize feeling tired or cranky, and how making the choice to take a nap will actually help them. What is even more fantastic is the hilarious surprise ending. Which I won't spoil for you, of course. 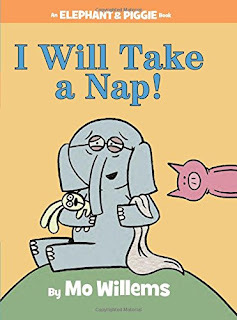 It did feel a little repetitive to me (which is great for early readers--don't get me wrong) but that did make it a bit more tedious than the other Elephant & Piggie books. Still highly recommended!